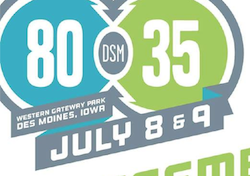 The folks behind Des Moines’ 80/35 this morning released the lineup for their July 8-9 music festival. The Friday night headliner is hip-hop legacy artist Nas; Saturday night’s headliner is Decemberists, who played in Omaha last year. Read the whole list here. More names to be added in May. One assumes this bodes well for the Maha Music Festival. Hopefully Team Maha got all the good bands first. We’ll find out soon. The Finks — Orenda & Todd — recently announced a couple new projects which you may or may not be aware of. Cho-Cho & Dasheen is a collaboration between The Finks, Jake Bellows, Morgan Nagler and a number of local musicians the band met while recording in Jamaica. The band’s first release is a 7” titled Cool Pool Reggae, due out on Record Store Day, April 16, limited to 500 copies. Is this a real project or a vacation project — i.e., will we ever see Cho-Cho & Dasheen perform live? A project we’ll definitely see perform live is Closeness, described as “moody electronic songs written, performed and produced by Todd and Orenda Fink.” The duo’s first live performance is April 30 at O’Leaver’s with Thick Paint and Spaced_Bar. Busy, busy, busy. I assume Todd also will be playing with Digital Leather tomorrow night when the band opens for Har Mar Superstar at The Waiting Room. OK, so what’s going on with The Faint? One show worth mentioning: Brad Hoshaw is doing three hours of acoustic music tonight at the Harney Street Tavern. The performance starts at 9 and is free. Will Brad be rolling out a cover of “The Fightin’ Side of Me” in honor of the legend?